This was the last dish we had to prep. 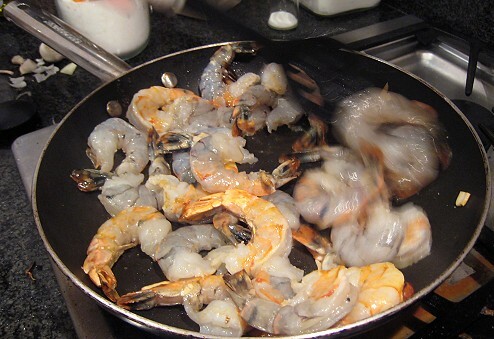 We were still debating what to do the prawns until about 2 minutes before we started. We determined that it was going to be a sautéed dish. In keeping with the "French" theme, I decided to use tarragon in this dish. 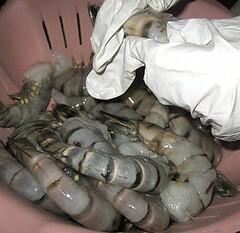 That there is JS peeling and deveining the prawns. What happened to my hands? It seems like I don't have fingers! Then, besides, the tarragon, what? What?! I kept suggesting oranges, but for some reason JS kept shooting that down. "I hate oranges! ", she said. But I persisted. That's a lesson for the kiddies: If at first you don't succeed, try and try again. The prep: zested an orange, chopped some tarragon, sliced some shallots. This dish was so simple and fast. 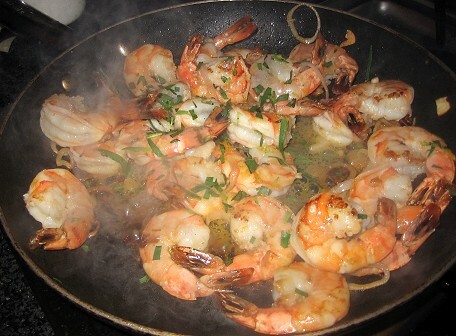 I heated up olive oil, then added the prawns. The shallots went in next. 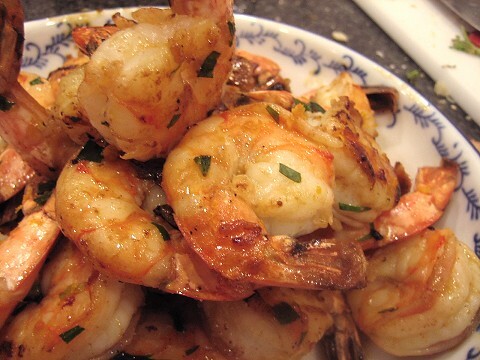 I waited until the prawns were almost cooked through, then added the tarragon and squeezed some orange juice into the pan. My apprehension stems from the fact that oranges are too sweet for me! I don't like my food tasting like it's been doused in orange juice. I suppose TS worked her magic and pushed the dish towards the savoury side of the spectrum. Perhaps my apprehension is unfounded. Save for a too-sweet orange-ginger beef a couple of years back, everything I've had with oranges have turned out all right. Hmmm. In any case, this dish is a keeper. I don't want to say it, but "I told you so!" 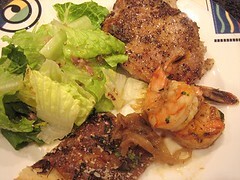 Oh, to round out our Simple French Meal, we just had salad of romaine with a simple "French" vinaigrette (Dijon mustard, red wine vinegar, shallots, salt & pepper... and of course, olive oil).